In Peoria, Arizona, one of the newest premier communities is Tierra Del Rio. Tierra Del Rio was first developed in 2010 by Pulte and only had two neighborhoods, however, due to its popularity, the community has continued to grow. In fact, when built out, the neighborhood will boast over 2,000 homes with gorgeous Sonoran Desert, Calderwood Butte, and mountain views. The gorgeous homes here are brand new and offer prospective homebuyers energy efficiency, as well as elegant designs. Tierra Del Rio is a great choice for homebuyers with children as the neighborhood is found within the highly-rated Peoria Unified District and served by Liberty High School and Zuni Hills K-8. Additionally, the Basis Charter School is only a mile or two away. Adding to the appeal of the area, part of the scenic Maricopa County Trail System and the picturesque Agua Fria River are both found along the community’s western border. These attractions afford Tierra Del Rio residents endless opportunities for recreation, while they also enjoy close proximity and easy access to great dining, shopping and entertainment options. When you buy a home in the Tierra Del Rio neighborhood of Peoria, you are positioned to enjoy all that this dynamic desert community has to offer. 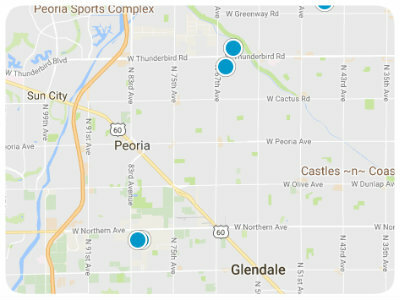 Peoria is composed of 162 square miles and has more than 120,000 residents. Though once a simple farming community, the city has grown into a must-consider destination and earned a spot on Money Magazine’s list of the top 100 cities in which to live. Buying a home in Tierra Del Rio enables you to be close to the spring training facility of the Seattle Mariners and San Diego Padres, as well as Rio Vista Park, Arizona Broadway Theater, and countless other spectacular attractions and destinations. If you would like more information regarding Tierra Del Rio real estate in Peoria, Arizona, please allow us to assist you and contact us today.